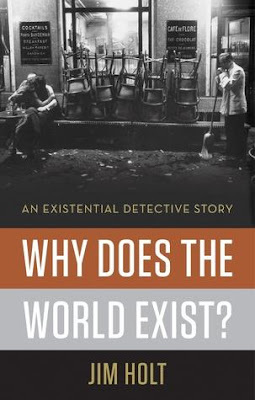 If you are filled with existential angst, worried about why you exist or what purpose your life serves, Why Does the World Exist might be the book for you. Rather than worrying about your own puny existence, why not worry about the existence of the entire universe (or multiverse) instead? Doing so might help put your own troubles into perspective. This book fills a much-needed niche. In my attempt to find an introductory text on metaphysics, I either found overly technical textbooks or new age drivel. This book serves as a nice intermediary between the two. Written by a philosopher who regularly contributes to The New Yorker and The New York Times, it is accessible both for its clear writing and Holt's clear grasp of the ideas he encounters. The driving force of the book is the question, "Why is there something rather than nothing?" Holt interviews many seminal thinkers in the fields of physics, philosophy, religion, and cosmology in an attempt to answer this question. Optimists such as Richard Swinburne, think there has to be a reason for the world's existence and that we may well discover it. Swinburne uses Bayes theorem, a mathematical formula that describes how new evidence raises or lowers the probability of a hypothesis, to defend the position that there probably is a God. David Deutsch is in the pessimists' camp, that there might be a reason for the world's existence, but that we'll never know for sure. Deutsch demonstrates the theoretical existence of a universal quantum computer. He believes in a multiverse, but not in an ultimate explanation. Adolf Grunbaum, "arguably the greatest living philosopher of science" according to Holt, is a rejectionist, one who thinks that there can't be a reason for the world's existence, and hence that the very question is meaningless. What I most appreciated about this book is that it brought back the theory of the multiverse from the theoretical dustbin. My understanding was that the multiverse, where multiple versions of the universe exist parallel to each other, had fallen out of favor among quantum physicists, where the theory originated. Yet many of the thinkers Holt spoke to resorted to the multiverse as an explanation for the origin of our own universe. If you don't have enough time to read this book, skip to chapter twelve's epistolary interlude: the proof. Jim Holt's take on the matter goes something like this: There's got to be a reason the universe exists. The reason must explain itself in terms of another reason. There are two reasons that work. One such reason is simplicity. The simplest version of the universe would be randomly generated, resulting in lots of generic possibilities. The other reason would be fullness. With fullness, all criteria would be met, resulting in many mediocre possibilities. If this explanation doesn't make sense to you, but intrigues you, then you might want to read the rest of the book. The drink to pair with this book is either nothing or every drink you can possibly think of, as a salute to Holt's two options in his "proof" of existence.